The Blues’ revival continued with a 32-29 win against the Waratahs in Auckland on Saturday. SIMON BORCHARDT reports. Having lost their first three games of the season, the Blues have now won four in a row. It’s the first time they have achieved that in Vodacom Super Rugby since 2011. For the Waratahs, it’s a third defeat from their last four fixtures, and that win against the Crusaders in Sydney now seems an anomaly. The Blues made an outstanding start to this match, racing into a 17-0 lead after as many minutes. Otere Black slotted an early penalty, before a patient buildup by the hosts, which saw good ball-carrying by the forwards, ended with a flat Ma’a Nonu pass putting Tom Robinson over in the left-hand corner. After a similar attack in which their big men were prominent, Nonu again gave the try-scoring pass, this time to Caleb Clarke, who broke through the defence and dived over under the posts. Then came the Waratahs’ fightback, with Foley’s cross-kick being collected by Israel Folau, who scored a record-breaking 60th career Super Rugby try, surpassing Doug Howlett’s tally. The visitors dominated the rest of the half. Having been denied a try by staunch Blues defence on a couple of occasions, Will Miller finally went over from a driving maul. Foley nailed the conversion to make it 17-14. The Blues needed to regroup at the break and they did, with a 14-phase attack finishing with a try to TJ Faiane, who took a good inside pass from Black. The conversion was missed, but the hosts had a handy eight-point cushion. It didn’t last long, though, as Foley and Folau combined to put Alex Newsome away in the right-hand corner. But the visitors undid all that good work when they spilt the ball in midfield. Rieko Ioane picked it up and put Nonu away for a 40m try. Foley and Black then exchanged penalties, either side of a disallowed try to Akira Ioane, with TV replays showing the No 8 had dropped the ball just short of the line. With five minutes remaining, Jake Gordon broke away from a Waratahs scrum down the blindside and slid over in the right-hand corner. But Foley’s conversion went wide and the Blues forwards then did brilliantly to run down the clock. 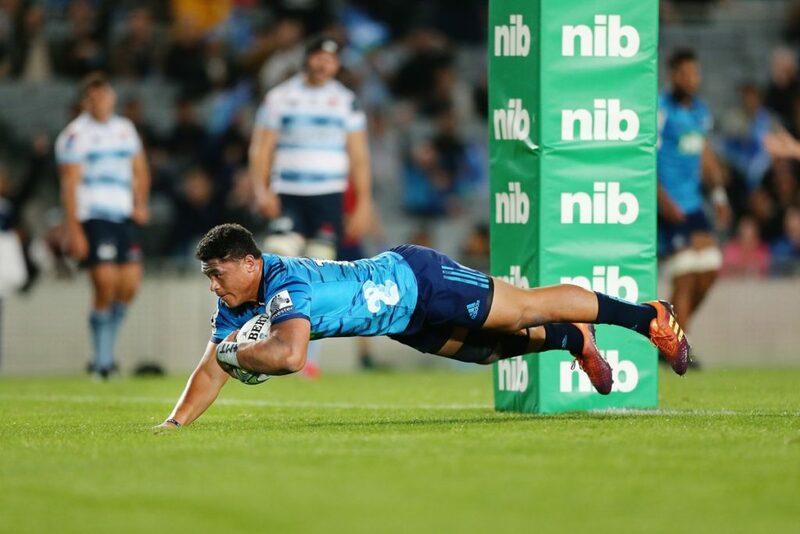 Blues – Tries: Tom Robinson, Caleb Clarke, TJ Faiane, Ma’a Nonu. Conversions: Otere Black (3). Penalties: Black (2). Waratahs – Tries: Israel Folau, Will Miller, Alex Newsome, Jake Gordon. Conversions: Berard Foley (3). Penalty: Foley.